Unmasked, Cancer Survivors Face The Symbol Of Their Torture : Shots - Health News For some survivors of head and neck cancer, the mask each had to wear to guide beams of radiation therapy remains a potent symbol. Some destroy the mask afterward. Others see a new beginning. 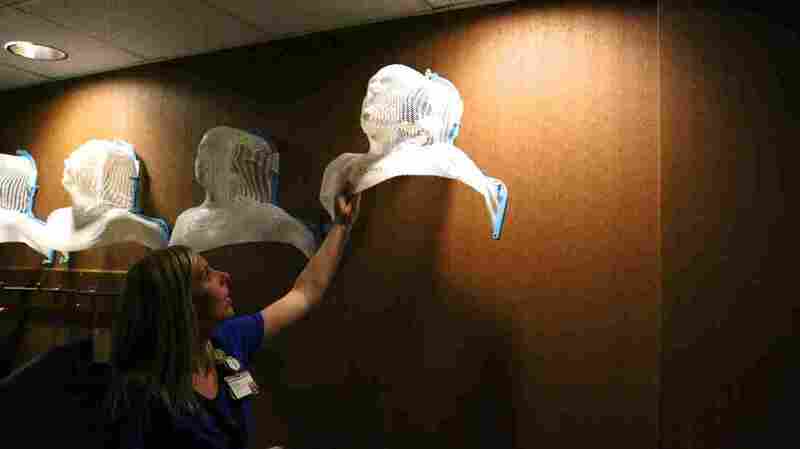 Emily Whittington, a radiation therapist at Vanderbilt-Ingram Cancer Center, pulls down a mask intended to guide radiation beams into patients with head and neck cancer. Every 15 minutes, for 10 hours a day, another patient walks into the radiation room at Vanderbilt-Ingram Cancer Center in Nashville. Each picks up a plastic mesh mask, walks to a machine, and lies down on the table underneath. Nurses fit the mask over the patient's face and shoulders. And then they snap it down. "It was awful," says Barbara Blades, who was diagnosed with cancer in her lymph nodes and tongue nine years ago. "It was awful to have your head bolted to a table. Not being able to move. Not being able to move your head." "I can remember lying there, thinking that I'm glad I'm not claustrophobic," says Oscar Simmons, who had cancer in his tonsils. "I sort of fibbed to myself," says Bob Mead, who was diagnosed with salivary gland cancer in 2011. "I thought, if I had to, I could sit up and pull the mask off." Mead later realized he couldn't have pulled up his mask. It's designed to restrain his head so that the radiation targets the exact same spots — down to the millimeter — across several weeks. The mask is made out of a kind of white plastic mesh that forms to a patient's face. It's see-through, but it looks almost human, like a ghostly person frozen in place. Other survivors, like Steve Travis, who had tumors on his throat and neck and went through several weeks of radiation, say it felt comforting under the mask. But when he finished treatment, Travis says, just thinking about the mask made him angry. "Because it sort of represented everything that had happened for the last four months," he says. "So I destroyed it." Cancer patient Troy Creasey lies under a radiation machine at Vanderbilt-Ingram Cancer Center. 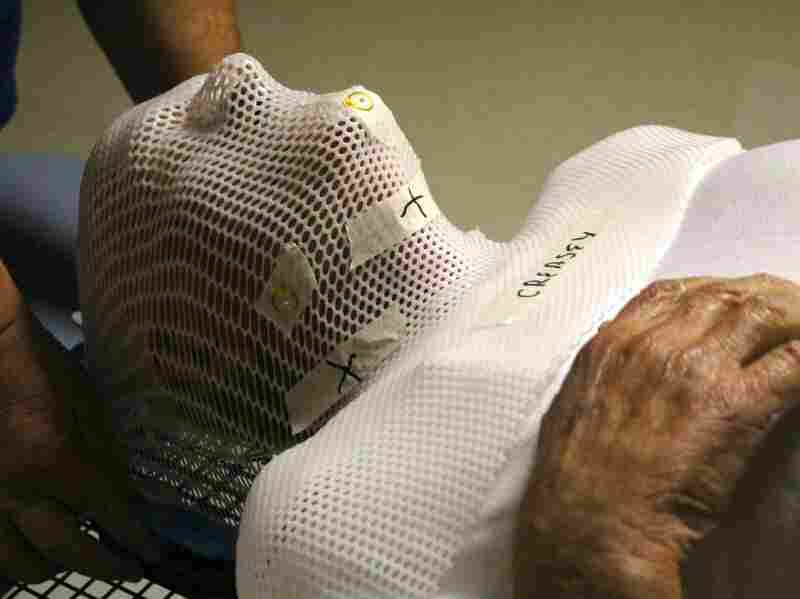 Radiation therapists snap the mask to the table to keep his head in place. Travis took it out to a family farm in West Tennessee and set it up next to a tree. He shot at it with two magazines from a .45 automatic — and then, for good measure, he burned it. "I kept it for the longest time, and it just sat there," says Barbara Blades, the woman with tongue cancer. "I couldn't bring it myself to throw it away, because I had radiation five days a week for seven weeks. It was a part of me for that amount of time." Blades ended up keeping the radiation mask in her garage. She finally threw it out after it was damaged during a flood four years ago. But Bob Mead, who had salivary gland cancer, held onto his mask with a sense of pride. "It's shaped like me. It fits me," Mead says. "It's like a favorite pair of jeans. People might not think of a mask that fondly, but there's a familiarity to it. But the mask is actually part of me, and it's that badge of honor that I have survived what is believed to have killed my cancer." Oscar Simmons, who had tonsil cancer, gave it to an artist who turned the mask into a sculpture of a mountain with a landscape around it as part of a project called Courage Unmasked, which has turned dozens of masks from survivors into art. "Its goal is to restrain, and they're going to expand," Simmons says. "And so, it's a thing of contrasts, I guess." As for Mead's mask — he still hasn't decided what to do with it. "Mine's actually sitting on my sun porch, on my shelf," he says. Every once in a while, he says he'll pick it up and put it on his face. It still fits. And that's OK, he says, because now, he's free to take it off.